Edward Granlund continues his contributions to the local community through the latest successful Habitat for Humanity Project. Westminster, Maryland, USA - October 17, 2018 /MarketersMedia/ — Edward Granlund, college student, continues his contributions to the local community through the latest successful Habitat for Humanity Project. The non-profit organization, Habitat for Humanity, works to provide people in need with a place to call home in their local community. Granlund spends his free time volunteering for the organization and helping to build these homes. This month, he helped with a home for Natasha and her son, Braxton. A dedication of the successful project will take place later this month as Natasha and Braxton are welcomed to the Habitat for Humanity of Carroll County family with a tour of their new home. Edward Granlund, Westminster, Maryland, is a student whose goal is to garner knowledge from the world. Along with his participation in community service, he is a student working toward his Bachelor’s degree in Cyber Security, gaining the tools and wisdom need to mitigate online technological threats, to combat hackers, and fight cyber terrorists. In addition to his goals in cyber security, Granlund also has gained extensive knowledge regarding financial investments and is fluent in both Spanish and English. He also holds a black belt in the martial arts and is a Crossfit practitioner. Edward Granlund, Maryland, has served alongside members of Habitat for Humanity for an extended period and looks forward to continuing his partnership with them. He finds fulfillment in aiding those in need in his local community and helping their dreams come true. Because Habitat for Humanity and other organizations like it rely on the services of volunteers to complete its sizable projects, Granlund and his team can come alongside other volunteers and give back to members of the local community like Natasha and Braxton. 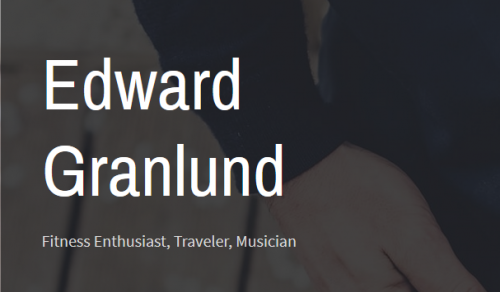 About Edward Granlund: Travel enthusiast, Edward Granlund, never turns down the opportunity to go on a trip. He never tires of flying and loves exploring the natural beauty of the world, trying new foods, enjoying spontaneous adventures, and sharing his experiences with friends and family. When he’s not on the road, Granlund resides in Westminster, Maryland, where he discovered his passion for martial arts. Learning from each experience, he earned a Black Belt, at Global Hap Ki Do. The Black Belt Certificate was signed and certified by Master Joe Borucki, and National Grand Master West. Mastering this art has helped Granlund push past many obstacles in life and contributed to his problem-solving skills which are necessary in furthering his career in Cyber Security. Currently, Granlund is earning his degree in Cyber Security at Carroll Community College. His goal is to work with an Information Security team to protect organizations from internal and external attacks and safeguard their sensitive data and critical infrastructure. He also hopes to explore more of the world in the coming years.